Cut Flowers tells the story of Katie and Sophia. 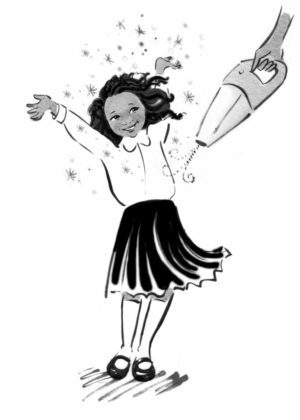 They are just two ordinary girls eagerly awaiting the summer holidays until their teacher, Miss Adams, gives them their summer homework – to prepare a presentation about what they did over the holidays. Little did they know that it would be the start of a lifelong mission to protect young girls all over the world. 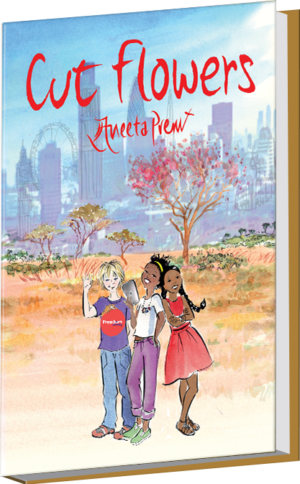 The adventure starts when Katie and her family go to Africa to meet her Granny Jojo and cousins for the first time. But behind the fun in the sun and the safari trips, something’s not quite right. Katie stumbles upon an old family secret and it’s up to her to get things out in the open. What really happened to her Aunt Daisy, and why does no one ever talk about her anymore? With her mum’s help, Katie finally begins to understand what happened all those years ago, but will she uncover the truth in time to save herself and her cousin Sweetpea from a similar fate? Meanwhile back in England, Sophia is completely unaware of the danger that her friend is facing as she joins forces with her new friend Charlie on their own seaside singing adventure, which brings them into royal circles. When Katie finally returns from Africa she needs all of Sophia’s support and creative flair to shine a spotlight on something that’s affecting millions of girls worldwide, but that no one seems to want to talk about.